WaikikiLux offers what no one else does, Two fabulous locations! 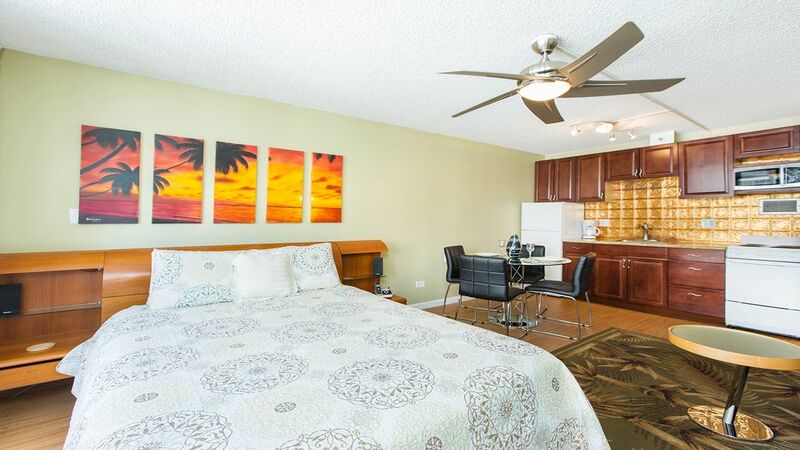 Suite 509 is right in the heart and excitement of Waikiki. Or Suite 704 at Turtle Cove is located right on the Beach. With breath taking views of the Blue Pacific, where serenity is the call of the day. DO ONE ~ DO BOTH!! Come and experience the best of both worlds of Hawaii with us!!! We offer Apple TV at our Turtle Cove property, Got a Netflix - I-Tunes account? Movies, I-TV, on your account. Hundreds of music channels and many more features free. Only at WaikikiLux Turtle Cove. Design your own vacation in paradise with our two Fabulous locations. All amenities including parking are included in the rate. First Class Luxurious Suites, Fully Equipped, Impeccably Kept, and in Great Locations. Be it the Excitement of Waikiki or the Serenity of the Beach at Turtle Cove. Do One, Do Both, we've got you covered. Our Waikiki suite 509 is just 1.5 blocks from the beach with too many shops and restaurants to mention all within walking distance. Or try what we like to call 'our little secret' a Fabulous one bedroom suite on the beach at Turtle Cove in Makaha. Where the biggest decison of the day could be the pool or the beach or just sitting on the lanai lost in the beauty of the Beautiful Blue Pacific. Luxury is still affordable, you don't have to compromise your accommodations to stay in Paradise, bring your clothes and toothbrush and enjoy. Oh, don't forget your swim suit! Our former guest say it best, read what they have had to say. Our calendar only shows one of two units so check with us for availability. We also run some great specials. Fabulous queen size beds with First Class linens, 1200 thread count sheets/bath~beach towels, 32' LCD TV's w/ Surround Sound, CD,DVD,IPod dock, Free Mainland,Canadian,Inter-Island & Directory assistance phone service, Wireless Internet, AC, Ceiling Fan, Adjustable lighting, Iron/board, Pool, Lanai's. Starter amenities, shampoo, conditioner, lotion and soap. Getting Married? We can provide you with a Honeymoon to always remember. Haven't you already spent enough just getting the rings on? Come pamper yourselves in Fabulous Luxury at a fraction of the cost of the big hotels!!! Turtle Cove, if you got any closer you would be in the water. First Class Linens, plus beach towels. This is our second time staying at this condo. Great location and great condo had everything we needed including a parking space. Hope to be back next year!!! We had a fabulous time in Honolulu. Thank you so much. The unit was only a block from the beach. It was clean, well maintained and fully stocked with everything from extra towels to a full kitchen (which we never used because we ate out so much). I had a conference at one of the "fancy" on beach hotels, they were charging $400 per night plus parking. This unit was a block away and was probably better than the conference hotel. It also had a parking spot included which until you get there, you have no idea how important that is. I highly recommend this property and if we ever return to Waikiki we will certainly stay here again. This apartment is located in the heart of downtown and close to everything. It is only two blocks away from Wakiki beach. Numerous restaurants and grocery stores are nearby. It is so convenient which makes our trip to Hawaii so pleasant. The room is very clean. The only downside is a little bit noisy. You'll love this location because it was close to everything. The bus service was awesome. The price was very reasonable. Very nice stay! Great studio apartment, with all the anemities. Literally had everything you need in a studio apartment, even a blender which was great for making my smoothies every morning. This apartment was right near a Main Street though which was very noisy at night, plus the bed was a bit uncomfortable so we didn't get the best sleep here. Would of also loved a full length mirror plus a clothes drying rack to hang up items to dry that can't go in a dryer, eg. swimsuits etc. Great location, easy to get around. Nice building and very friendly owner. Enjoyed our stay here. If returning, would probably stay somewhere abut more secluded so it's quieter, but in terms of the actual accomodation, it was a great apartment!